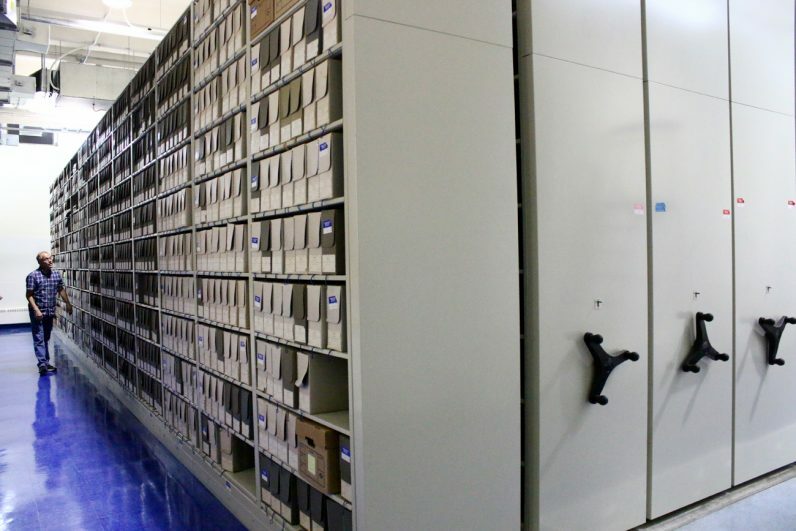 The Philadelphia Archdiocesan Historical Research Center, commonly called “the Archives,” has both a new name and a new location although it will not be officially dedicated until Sept. 21. The new name is the Catholic Historical Research Center of the Archdiocese of Philadelphia, which reflects more accurately what it really is, according to Cait Kokolus, the director. The Archives encompass all things Catholic, not just records of the archdiocese itself. For example there is a large collection on permanent loan from the American Catholic Historical Society, which covers a wide range of Catholic history. A recent acquisition, Kokolus says, is the archives of the Sisters of the Blessed Sacrament, who are closing their motherhouse in Bensalem. This collection is important because of the ample material on St. Katharine Drexel and the Drexel family, which was deeply involved in the charitable works of the archdiocese, and also the everyday life of a religious congregation from the late 19th century to the present. There could be further acquisitions of this nature as other locally based congregations with dwindling numbers have the need to find a place for records that are an important part of Catholic history. The new site for the Research Center is at the former school of now-closed Our Lady of Ransom Parish in Northeast Philadelphia. The main collection of written material, including books, is on the lower level, formerly a gymnasium but thoroughly renovated with excellent lighting and modern roll-out shelving that enables twice as much storage in a given space. Each shelf has a protective cover. This area of the building was specifically chosen because the sheer weight of books and written matter in massive quantities can be too much for upper floors to bear unless the building was specifically designed to do so. The upper floors of the building proved ample room for offices, meeting rooms, storage areas, computers and facilities for viewing of material preserved on microfilm or electronically, which is the wave of the future for research. The new home is light years better than the former location underneath St. Martin Chapel at St. Charles Borromeo Seminary in Wynnewood, which had more in common with a dungeon than an archive. There was no office space in the gloomy open floor plan that had bookcases arranged into alcoves used as makeshift offices, with everything else tucked in as best as possible, and all without air conditioning. Plans for the new Research Center go as far back as the late 1990s and Catholic Life 2000, the archdiocesan fundraiser at the turn of the century. One of the stated goals was funds for a new archival center, but nothing happened until now. It certainly became more of an imperative when the intention to sell at least part of the seminary campus, possibly including St. Martin Chapel, was announced last year. 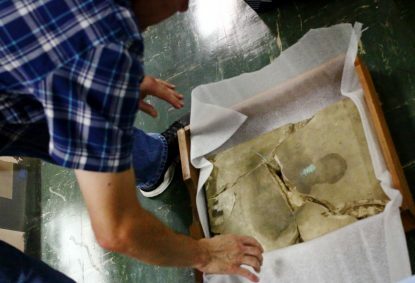 Shawn Weldon opens a packing box containing an image of Bishop Francis Patrick Kenrick. Probably the most important part of the collection is the papers of most of the bishops and archbishops of Philadelphia. For all of the earlier bishops, with permission, these papers can be examined by scholars. Papers of the early bishops are not voluminous; the first eight comprise just eight shelves. “We have a little from Bishop Egan (the founding bishop of the diocese), a little more from Bishop Conwell, more from Bishop Kenrick, not much from Neumann, less from Archbishop Ryan and less from Archbishop Prendergast,” said Shawn Weldon, who has been with the Research Center for 27 years and probably knows more about Philadelphia Catholic history than anyone in the archdiocese. And if he doesn’t know, chances are he can locate in the collection. Bishops who had short administrations obviously would have less material, but some bishops had less interest in their writings being preserved. With Cardinal Dougherty, who served for 33 years, a serious effort for saving correspondence was made. In that age of carbon copies there are not only letters the cardinal received but copies of every letter he sent. His papers take up 31 shelves. His successor, Cardinal O’Hara, whose administration was less than nine years, has eight shelves, and Cardinal John Krol has 130 shelves. There are also the papers of Cardinal Bevilacqua and Cardinal Rigali, but as is customary in more recent administrations, these are still closed. One wonders if in this age of computers and instant messages, just how large the written records of future administrations will be. While the focus of the collection is on records rather than books that can usually be obtained in libraries, the Research Center does have Catholic directories both local and national tracing back to the beginning of the diocese, which can be invaluable aid for researchers. On a hit or miss basis there is also material from the individual parishes, for example parish histories and programs or sacramental records that are of use to people researching parish histories or family trees. There are copies of the former The Catholic Standard and Times tracing back to its founding and of its predecessor, The Catholic Herald. One of the difficulties of research with these newspapers is they were written for the moment and articles were not catalogued. One needs to know when an event occurred to look it up. One amazing collection is all of the photographs taken by Robert Halvey who was the main photographer for The Catholic Standard and Times for virtually the entire second half of the 20th century. This collection, which was acquired after his death, was meticulously cataloged by his wife Margaret and is an invaluable resource, especially for researchers of parish and diocesan history. The Research Center also holds scrap books of important events of the archdiocese maintained for a period of years. An odd item in the collection that Weldon points to is the records of the 19th-century Bishops’ Bank, where any Catholic could deposit money. Interestingly, as Weldon points out, many of the depositors were immigrants, including women, saving a small share of their modest earnings. This was phased out under Archbishop Wood, who did not think the church should be in the banking business. The Research Center has a number of historical artifacts that have accumulated over the years – religious paintings, crosiers, statuary, reliquaries and even a papal tiara. One fascinating item does not have an apparent religious connection but is nevertheless important. It is a sturdy wooden chest donated by the former Memorial Hall in the city’s Fairmount Park, which was a civic museum that was built for the 1876 National Centennial Exhibition and is now the Please Touch Museum. On the lid of the chest is a brass plate with the date 1686 and the initials G.W.N. It is believed to have been brought from Wexford, Ireland in 1686 by George W. Nixon, who is the first recorded Catholic to settle within the present boundaries of Philadelphia. His grandson, according to diocesan histories, was John Nixon who on July 8, 1776 gave the first public reading of the Declaration of Independence from the steps of Independence Hall. Another interesting artifact is the Mass kit used in France by Father Joseph Wolfe during World War I. He later became national chaplain for the American Legion. The Research Center is just filled with many treasures written or otherwise, and it finally has a home worthy of its holdings. 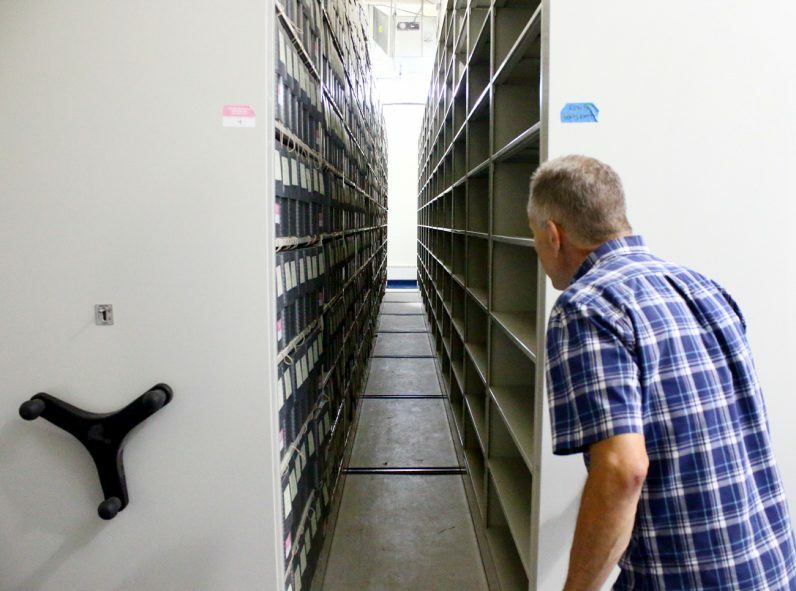 Archivist Shawn Weldon reviews the ample space for records in the new shelving and accommodations at the Catholic Historical Research Center of the Archdiocese of Philadelphia, located in Northeast Philadelphia. In response to Ms. Definis: First, thank you for your information. I’ve used ancestry.com for searches of baptisms and marriages, primarily in Ireland, based on where I knew particular events occurred. I’m hoping the church records specific to Philadelphia and a few additional locations in Pennsylvania will open up new information relevant to my family and will be informative in additional ways. So my question still remains. Thanks. Hello, Regarding information from the individual parishes, relevant to those searching for information for their family tree, and regarding information about immigrants who made deposits in the Bishop’s Bank, I’m interested in knowing the following: Is it possible for people to search these things electronically? I live in Oregon and cannot afford to visit Philadelphia at this time, but have a serious interest in information you may have in your collection. My GG Grandfather came to the U.S. from County Donegal in 1855 (at age 11 without his parents) and I am certain he was naturalized through the Supreme Court of Pennsylvania on approximately September 21, 1868. Civil war records indicate he may have lived on Newkirk Street in Philadelphia in 1863 and may have worked as a carter, if he is the same person named in those records (he is the correct age). His younger brother worked in the mines in Carbon County for 7 years (starting in about 1861). I’m looking for records on my GG Grandfather Phillip (or Philip) Brogan (1844 – 1898) who would have left Philadelphia in approximately 1870, ultimately settling in Oregon. I’m also looking for information on his younger brother Thomas Brogan. I believe there are many missing pieces regarding the rest of our extended family that can be resolved with more information from Philadelphia. I believe there were Brogans and McGees in that area who were relatives. Information in Philadelphia may lead me to facts concerning relatives of their parents — data that I otherwise have not been able to track down. Their Dad was John Top Brogan and their Mom was Margaret McGee, both from County Donegal. I think John Top Brogan’s siblings may have gone to Philadelphia. Any help gaining access to research materials would be much appreciated. Thank you for considering this! Catholic parish records like baptisms and marriages can be accessed electronically on “findmypast.com.” You can get a one-month subscription for a very reasonable price and obtain all the parish records. They’ve been very helpful in my genealogical research. Do they have records of Saint Vincente Home in Delaware County/Philadelphia? I am looking for my mothers records 1929-1939. Former Parishioner at Ransom whose children attended school there. I am glad to see the building is being used for something related to the Archdiocese.